oh no... Life is hard for the cadets. Due to lack of activity in the San Fierro area we have decided that it's for the best to create a public event in that area to bring San Fierro to life. 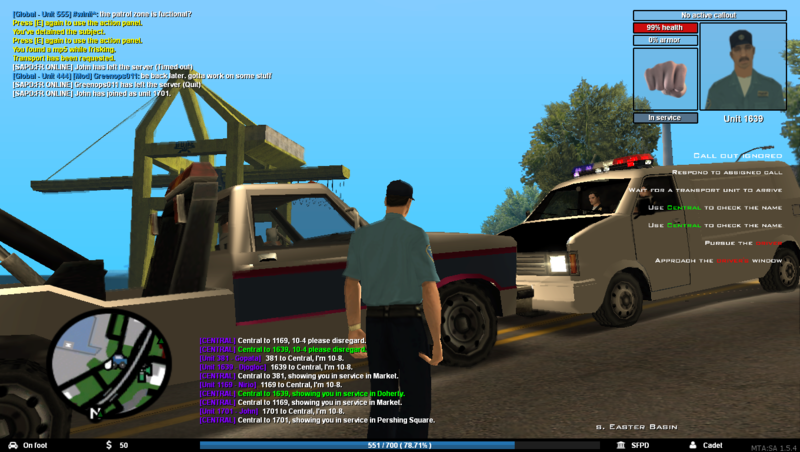 We're more than aware that the lack of activity in San Fierro is partially our fault as well as it is the fault of the general dislike of the San Fierro area with most of the playerbase. Why our fault partially? Well most of the callouts that are specific location based weren't really introduced in San Fierro due to lack of time as much as it was introduced in the Los Santos and it's surrounding county areas. As a result, we will release a 1.0.27 update near the end of the week (before the event) that will push all the missing callouts into San Fierro to give us more things to do, additionally parked vehicles will also be added into San Fierro to bring some more life into it. 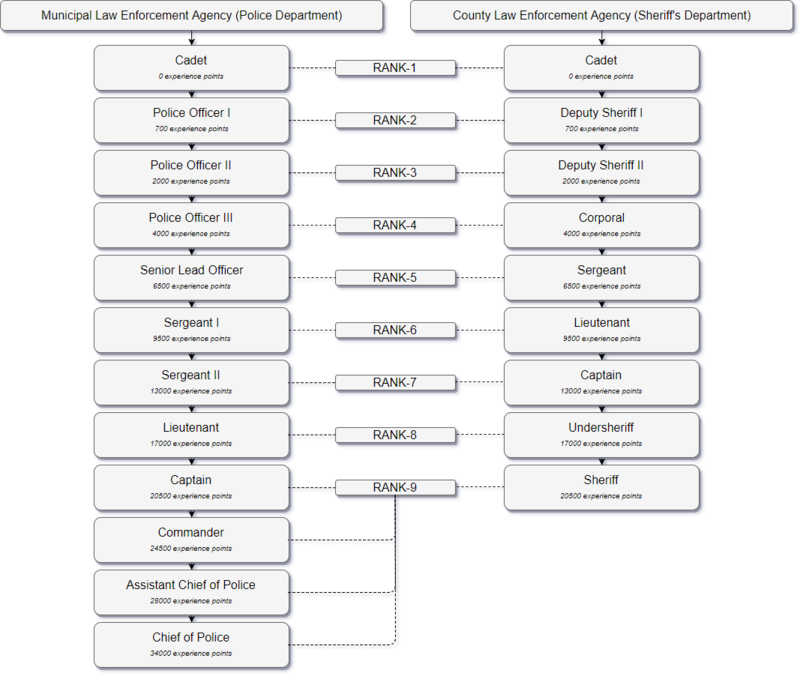 Unlike the SAHP patrol, in this patrol players will be able to respond to callouts which will give everyone some more things to do, so, if you haven't, now is the best time to start ranking up your SF department to Police Officer I or higher! Discord attendance is required, microphone and it's usage is not, if you're not on Discord you will be kicked out from the event as it's really neccessary that you're on it to hear dispatch callouts. To attend just simply report at the San Fierro Police Department garage for the briefing on Saturday, November 11, 21:00 GMT+1. 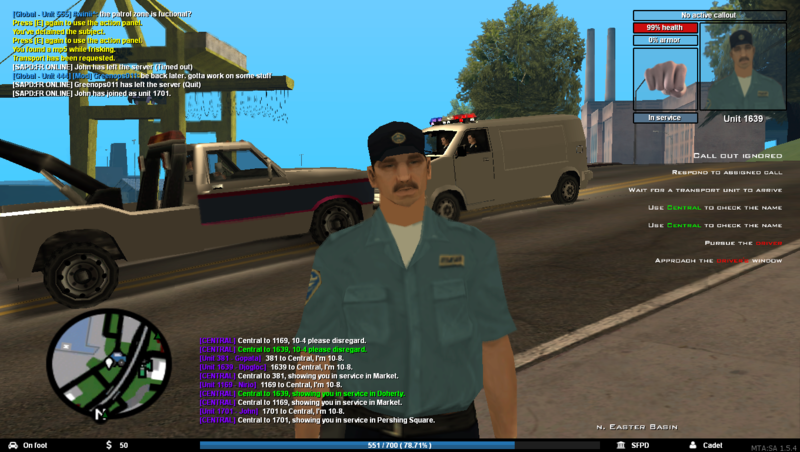 As some of you may know, December 17 2016, Saturday was the exact time when we opened the doors for our version of SAPD:FR Online to the players. Initially for the first version we did update quite a lot from Palm Beach Games' version but we did find out that there was still a really long way to go for us from there. Throughout the time of the following few months we've released updates that were focused on improving the gameplay as well as massively polishing all of the bugs that were present and I think that we did earn the right to say that we've cleaned them out quite well, granted, there are still some bugs present that need resolving but those bugs pretty much require major script rewrites in the AI system which is something that we're going to get to eventually. Not so long after our release we announced our plans for the big 1.1.0 update which you guys have been waiting for so long and boy are we happy to say that you're practically standing on the 1.1.0's door step! 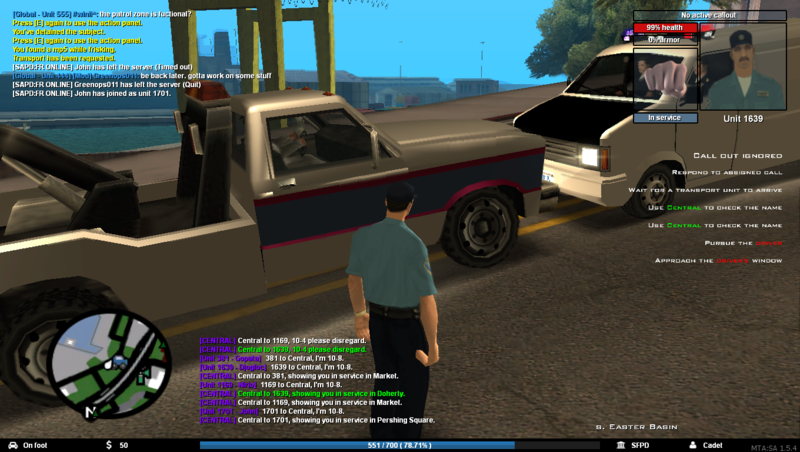 To celebrate our first and a rather big year with SAPD:FR Online we've decided to start a convoy that will start at the LSPD HQ and will slowly drive all the way to Mountain Chilliad where we plan to celebrate the anniversary with you guys. We will most likely map some things on top of the Mountain Chilliad and probably add some music as well as proper dance animations for you guys to enjoy as much as you can, additionally we will also make a quick brief either via in game chat or Discord chat (we're not sure yet) and then release the big one! And you know what that means! That's right, medics! 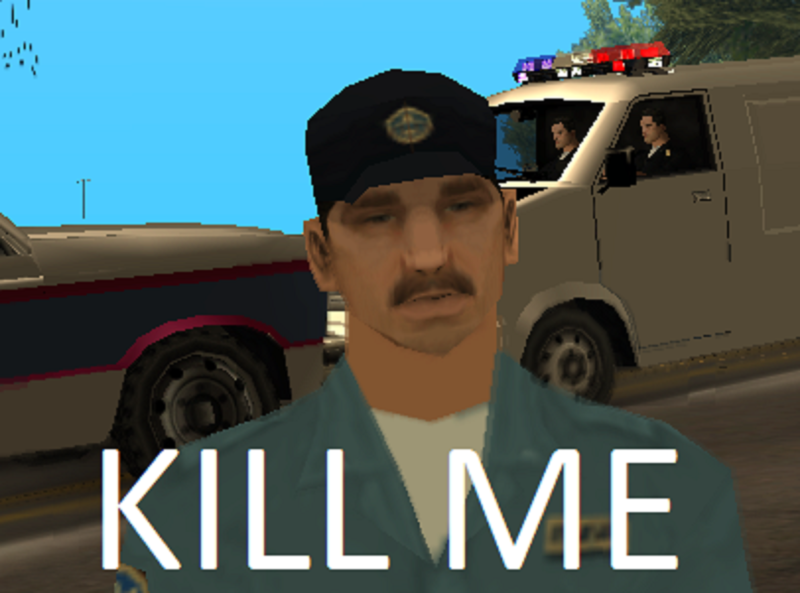 After the anniversary celebration you guys will finally get access to the Medic branche and finally get the chance to feel the joy of driving a guy bleeding to death in your ambulance and slowly watching him die on your way to the hospital because that's what medics are all about, no? Some of you have had the chance to see the medics on the work during the Management beta test but you still have not had the chance to experience the system nor see how it actually works which we're really excited to let you guys finally experience! We won't say anything about it now as we want you to have the full experience at the time it's released. What other way to celebrate than let you guys rank up twice as fast? In addition, you can also brag to your friends that you were among the first users to use the medic system and have gotten a faster ranking up in return! Double EXP weekend will start on December 16, Saturday and end early December 18, Monday. It all starts December 16, Saturday, 21:00 GMT+1 and finishes December 18, Monday, 10:00 GMT+1, celebration with the staff members, management, etc on the other hand will probably end 1-2 hours after the start on Saturday. 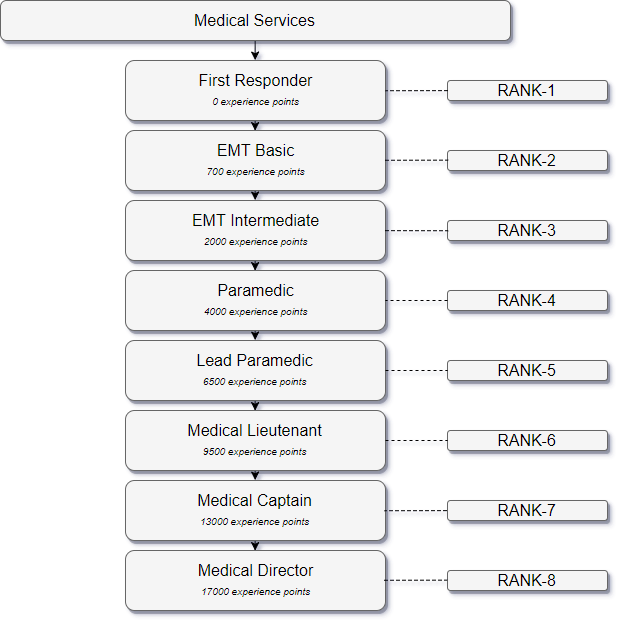 Down below you will find all of the information in regards to ranks within departments that exist in SAPDFR. This topic will include the rank hierarchy as well as the privileges and unlockables gained from ranking up. Credits: Kalevius (Joint structure hierarchy, unlockables to ranks), Dandr3 (exp levels) & OfficerJacob (General help with level measurments & unlockables). Disclaimer: I acknowledge the fact that there are several topics on this section that already cover some and most of what was mentioned above. This is a merged topic with additions to help newcomers easily learn the game mechanics without jumping from one topic to another. Re: [Contest] YouTube art - SAPD:FR Online I didn't knew which type you want so i made 2 versions. As some of you may already have heard, we'll be doing a full server maintenance which will affect all of our services. This will include various updates on the dedicated server itself, as in OS updates, security patches and several firewall changes. Most of our services (most likely all of them) will be affected by this and will be down for the entire time. Expect the services (except Discord) to be down for at least 5 hours, starting at 13:00 gmt+1 (1PM, server time). More information and/or progress will be shared on the Discord channel. If you haven't make sure to join the discord channel by clicking right here or by visiting the link https://discordapp.com/invite/0sefStnGcNuXyA8u.